A functional test of the Hubble Space Telescope's Advanced Camera for Surveys, overhauled during a spacewalk Saturday by astronauts John Grunsfeld and Andrew Feustel, indicates success reviving the instrument's heavily used wide-field channel, officials said early Sunday. But testing shows the overhaul failed to resolve power problems with the camera's stricken high-resolution channel and it appears "down for the count." The ACS, a sophisticated camera installed during a shuttle servicing mission in 2002, was designed to operate in three modes: a high-resolution channel, a wide-field camera and a so-called solar blind channel. Following major power system failures in 2006 and 2007, the heavily used wide-field and high-resolution channels were knocked out of action. The solar-blind channel later was restored to operation. During Saturday's spacewalk, Grunsfeld replaced four circuit boards in the wide-field channel electronics and attached a replacement low-voltage power supply. 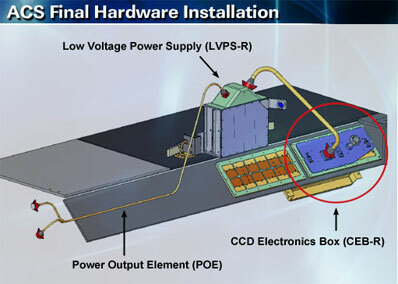 Engineers devised a way to "back-power" the high-resolution channel with the new power supply and control electronics, although they were less confident of that plan's success. The ACS passed an initial aliveness test during the spacewalk and engineers at the Goddard Space Flight Center in Greenbelt, Md., began a more detailed functional test later in the evening. An early step in that procedure turned on the high-resolution channel and almost immediately engineers saw it drawing too much current. The test was halted and commands to the high-resolution channel were taken out. Testing of the wide-field channel later resumed. "The wide field channel was tested this evening, that was the major focus of the spacewalk yesterday, trying to get that channel back up and running," mission control commentator Josh Byerly said early Sunday. "The payloads officer confirmed that everything looks fine on the wide-field channel. So good news on that front. "The high-resolution channel, however, ran into some issues, some power fluctuations were seen. ... They did confirm the short in the wiring of the high-resolution channel was actually upstream of where the astronauts were working yesterday. What this means is the repair was not successful on that specific channel." The wide-field channel is the most heavily used by the science community and as a result, the repair work Saturday is "still considered a success, even with this high-resolution channel being down for the count," Byerly said. In an interview before launch, Hubble Program Manager Preston Burch described the complexity - and the unknowns - associated with repairing the ACS high-resolution channel. "It turns out there are shared copper paths between the electronics for both of those channels," he said. "So what we said was, hey, why don't we get to the high-res channel through the electronics paths that are connected to the wide-field channel? We'll just back power the existing printed circuit boards that are in the high-resolution channel CCD. "We tested that on the ground and sure enough, it turns out to be feasible to do that. The only question mark is the status of the low voltage power supply on the MED 1 and MED 2 sides. In other words, it's possible that if there's damage on the sides of the interpoint converters, the secondary sides that are powering the high-resolution channel, it's possible there are some short circuits there that will prevent this scheme from working. Particularly on the one side that suffered the major damage. That may not work very well." During the spacewalk Saturday, Grunsfeld installed a new low-voltage power supply "that will try to rejuvenate, or bring back to life, the high-resolution channel by back powering the high-res channel through these shared copper paths that connect to the wide-field channel," Burch said. "I won't say it's a long shot. It IS somewhat of a long shot, but people need to understand that this doesn't have the same degree of rigor as, let's say, building a brand new science instrument or a new black box that we're hooking up to standard interfaces that already exist on the telescope. This is really a bit of an experiment."